Philadelphia native and veteran DJ Cosmo Baker is executive director of Scratch DJ Academy's Philly branch. Cosmo Baker is in a special class of DJs. Along with luminaries like DJ Jazzy Jeff, Rich Medina and King Britt, Baker is one of those elite, internationally respected Philly DJs who traverses the globe, spinning tasteful, soulful music for packed dance floors year-round. 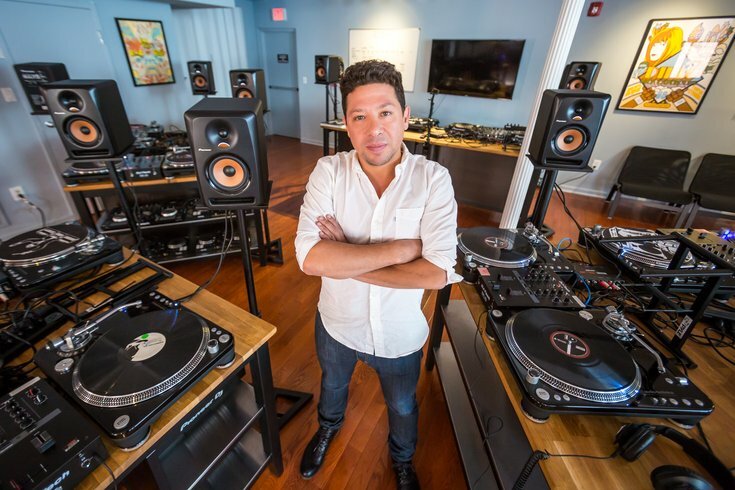 For the past 20 years, Baker has melded his deep knowledge of music and party-rocking instincts with a keen business sense that has led to his current role as director at the Philly branch of Scratch DJ Academy. I caught up with Baker at Scratch’s Old City headquarters to chat about the music, the business and WKDU’s upcoming Electronic Music Marathon, which he and dozens of other DJs — myself included — are participating in. I know that you’ve been involved in Red Bull’s Thre3style competition and Scratch DJ Academy in addition to touring, etc. I’m curious about what your day is like as a working DJ? In regards to my involvement here at the Scratch DJ Academy, I’m [an instructor] in the Philadelphia branch as well as a partner. I’ve got a great staff of seven employees who are professionals and wonderful people. So much of the work that I do in and out of the office is entrepreneurial work, creative work, and there’s a lot of different dimensions, to be honest. I have my fingers in a lot of different pies, so to speak. Tell me about opening up a branch of Scratch here in Philly. I ended up back in Philadelphia after living in Brooklyn for about 12 years or so. At the time, I considered it to be temporary. After being away from Philadelphia for so long, I noticed that the city had undergone a dramatic change. It’s a really exciting time to be living here. I had worked with Scratch since about 2006, 2007, always as a guest instructor, doing [DJ] sets and talking with the students. It was interesting to me because one of the things I noticed in their guest instruction was that I had nothing on these other instructors as far as turntablism and scratching, etc. So when I’d guest, I ended up talking more about business acumen and developing one’s personal brand as a DJ. And how long did it take to get the school up and running? It took about two years, and over the course of those two years, the company opened up an expansion in Chicago and one in Atlanta. It was a lot of work; we developed brand partnerships, engaged the community and looked for real estate. In 2015, after an exhaustive search, a friend of mine who’s a Realtor told me about this interesting space at Second and Chestnut. I walked into where we are now, and yeah it was raw, but within 90 seconds I knew this was it. I’ve always loved and respected WKDU, and it’s really an important thing that terrestrial radio still exists. I’ve been listening to KDU since I was a kid. Back in the day, WKDU used to have a show [called 'The Avenue'] with [legendary local radio personality] DJ Cosmic Kev and [former manager for The Roots] A.J. Shine, which was a great show. So much of the rap music that I was into in the early ’90s I first heard on that show. And on Sundays, they’d play dancehall/reggae all day. I’ve always loved and respected WKDU, and it’s really an important thing that terrestrial radio still exists. I think that it’s important that we recognize that radio is something that’s free. You don’t need a conduit. You can just pick it out the air. And it’s a dying medium, so I think that it’s important to ensure that it has longevity and life even as technology is changing. And how did you get involved as a partner and spokesperson for the Electronic Music Marathon? As far as my involvement in the marathon, I gotta leave that all up to [DJ/Drexel professor] Chris Burrell. He was the guy that hit me up last year about getting involved with the Electronic Music Marathon. And I think my role as the guy here at the Scratch Academy [was a factor]. Last year we were able to bring the Mural Arts Program as the marathon’s main partner-sponsor, and I’m on the advisory council of the Mural Arts Program, so that worked out. I was super happy to be involved. And then this year, when I learned that we were partnering with PAWS [Philadelphia Animal Welfare Society], well, you know how I feel about that [laughs]. I love dogs, and PAWS isn’t just about dogs, but it all really just resonated with me. We have a really great promotional campaign that features me, DJ Royale and Gun$ Garcia and our dogs, and we’re talking about being part of a bigger thing. We’re all part of a community. It’s really been a crucial thing for me in my career, that there always be some way of giving back, and I think that’s something that people should be more in tune with.